Trumpet vine is a ferocious grower, often reaching 25 to 400 feet in length with a spread of 5 to 10 feet. It is a very hardy vine with vigorously flowering stems often used as a screen and ornamental backdrop. The vine forms seed pods after blooming, which resemble chubby little bean pods. What to do with these trumpet vine pods? You can try growing vines from seeds inside. Seed germination may be variable, so it is best to leave the pods on the vine until they are mature. Trumpet vine seed pods should be harvested three months after blooms have faded when they have turned from green to brown. Those interesting looking pods on your Campsis vine have ornamental appeal and are full of seed to save and plant if you choose. Deciding what to do with trumpet vine pods depends upon your patience and adventurous levels. Leaving them on the plant for a fun visual effect is one option, but so is harvesting the seed and propagating more of the rampant vine. Be wary, the plant is considered too aggressive for some regions and may pose a problem if cultivation escapes into native flora areas. The curious gardener may just have to try growing the vine, however, so here are some tips on how to plant trumpet vine seeds for the best chances of success. Seeds are found inside the 2-inch long pods that form after flowering. The seeds are flat, round brown discs with fine membranes that flare out from the edges. The seeds of trumpet vines may be planted at harvest or dried and stored for spring planting. Plants will take several years from seed to develop flowers. 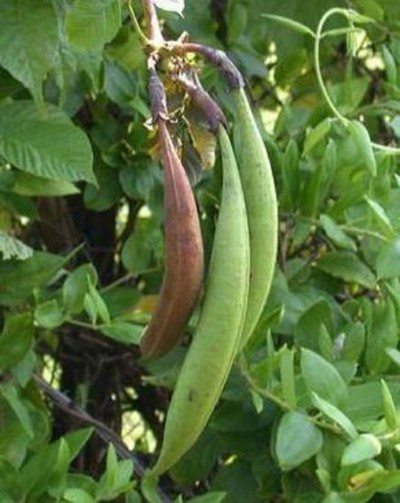 Harvest the pods when they are dry and brown. Use gloves when harvesting to prevent contact with the sap of the plant which can cause dermatological irritation. Crack pods open and spread the seed on a paper towel to dry for a week. Store seeds in an envelope in a glass lidded jar in the refrigerator until ready to sow. Trumpet vine seed pods left on the vine also provide interesting detail after the plant loses flowers and leaves. Germinating trumpet vine seeds is not the fastest way to get more plants. Campsis quickly propagates through root or sucker division and layering or cuttings. Seed germination seems to be more rapid when seeds undergo a chilling period of at least a couple of months. Soak seeds for 24 hours and then store them in bags filled with damp plant starter mix in the refrigerator for two months. In warmer climes, plant seed right after harvest and drying, in containers outside where cool winter temperatures will provide the chilling period. In cooler regions, chill in the refrigerator and start outdoors after all danger of frost has passed or inside in flats 6 weeks before the date of the last freeze in your zone. Use good garden soil amended with organic material or a purchased potting soil when planting seeds. Sow seed on the surface of the soil and lightly sprinkle more soil over them. Choose a well-draining container to prevent damping off and root rot as seeds germinate and sprout. As with any seeds, provide moderate water and place the flat or container in a warm area for quicker germination. To enhance germination, you can also cover the container with plastic wrap. Remove it once per day for an hour to allow excess moisture to evaporate. Fall planted seeds outdoors usually receive enough natural moisture unless your region is especially dry and should not be covered. Keep any weed pests away from seedlings as they grow. Transplant indoor plants in spring when soil temperatures have warmed to 60 degrees Fahrenheit (15 C.) or more.